August 1968: There is no sure-fire way to win a Presidential election. 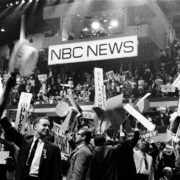 But there is a pretty reliable method for losing one, and it was clearly demonstrated 50 years ago this month when Democrats gathered in Chicago to nominate their Presidential candidate. Conventions are supposed to help bring the party together, but this one was a political — and PR — disaster. To be fair, 1968 was a tough year for everyone. MLK and Robert Kennedy both had been assassinated, and the Vietnam War was tearing apart both the country and the Democrats. Many delegates arrived in Chicago angry at the party, and they were joined by an “army of protesters” outside. Nervous city officials responded by surrounding the convention hall with steel fence and barbed wire, and the main doors were bulletproofed. As CBS news anchor Walter Cronkite said, the hall resembled a police state. There is disagreement about how much long-term damage the convention did to the Democrats, but here are two telling stats. First, in 1964, LBJ won 61 percent of the vote; four years later, Hubert Humphrey got less than 43 percent. Second, while Democrats had won eight of the 12 previous elections, they lost seven of the next 12. Probably not the best metrics. No doubt the Democrats who gathered in Chicago that summer were hoping for some “in-conventional” thinking, but the riots and inner conflict were a bit more than they had bargained for. And as every PR pro knows, if you want to beat an adversary, the first step is to not beat on each other. 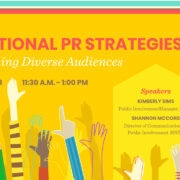 Reaching diverse, segmented audiences is often among the most challenging work for PR professionals. Without the resources to reach minority communities, PR professionals need exceptional strategy and tactics. Kimberly Sims and Shannon McCord work in the communications and public involvement department at the North Texas office of HNTB Corporation, an employee-owned infrastructure solutions firm serving public and private owners and contractors. They will share their knowledge and past successes in penetrating hard-to-reach, diverse target audiences. 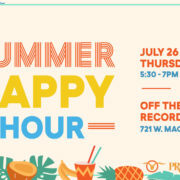 https://fortworthprsa.org/wp-content/uploads/2018/07/PRSA-2018-Creative_August__1920x1080.jpg 1081 1921 Hannah Lacamp http://fortworthprsa.dividesignpros.com/wp-content/uploads/2019/01/GFWPRSALogo2018-300x287.jpg Hannah Lacamp2018-07-31 17:16:212018-07-31 17:20:41Join us for our next GFW PRSA luncheon on Wednesday, August 8, at Colonial Country Club!